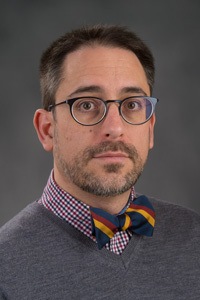 BLOOMINGTON, Ill.— Diego Mendez-Carbajo, associate professor of economics at Illinois Wesleyan University, will speak on “The Economic Impact of Art & Culture in Bloomington-Normal” on March 10 at the McLean County Museum of History. His presentation will be offered through the "Lunch & Learn" Series, a collaboration between the McLean County Museum of History, the Collaborative Solutions Institute and Illinois Wesleyan. Mendez-Carbajo will discuss the estimated local economic impact of the 16 largest arts and cultural organizations in Bloomington-Normal, including the Illinois Shakespeare Festival, the Illinois Symphony Orchestra, and the McLean County Museum of History. Mendez-Carbajo’s “Lunch & Learn” presentation will take place from 12:10-12:40 p.m. in the Governor Fifer Courtroom on the second floor of the museum. Attendees are encouraged to bring a lunch with them to the free event and join in the discussion.